Material (geologic): Campanian (Late Cretaceous) flint from Miocene deposits. Mode of occurrence: Small fragments of blocks. Cortex: Worn, thin, grey-brown, transition sharp. Colour: Pale brown to light yellowish brown (10YR 6/3.5). Pattern: Slightly flecked (recrystallization haloes). Appearance: Homogeneous material with a medium lustre, semi-opaque, moderately smooth, medium-grained. Structure: Fluidal arrangement of grains. Grains: 15 %, pale, subangular with high (160 µ) to low sphericity (sponge spicules, 5-700 µ). Grain composition: Numerous small globose foraminifera, very numerous monaxon and triaxon sponge spicules, often surrounded by recrystallization haloes; frequent iron oxides. Geographical description: The source is located in some fields, under a kilometre away in a northwesterly direction from the hamlet/village of Villes, some eight kilometres SW of Bellegarde-sur-Valserine. The latitude/longitude coordinates are a direct transformation of these data on WGS84 and are accurate to the same level; the 1-second precision is given to prevent any rounding-errors. The location can be found on the 1:25 000 topographical map sheet 3329 W of the French Institut Géographique National. Geology: According to the geological map, the substrate belongs to the Early to Middle Miocene (without distinction between Burdigalian and Helvetian), unit m1b-2a. Type of source: Secondary. 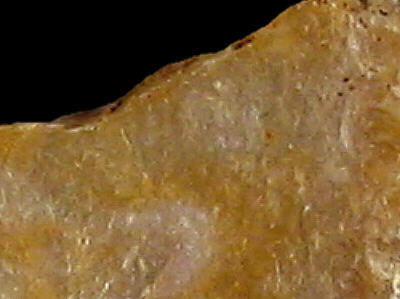 Redeposited Campanian flint from Miocene sediments. 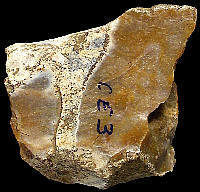 Other types of flint: The flint here constitutes quite a mixed lot, with predominantly Late Cretaceous material like CE1a, CE1b, CE1c, CE2, CE4a, CE4b, and CE5, but also Hauterivian (Early Cretaceous) material of the Ht3-type.